Framed Personalized Anniversary Gift. Wedding Anniversary Gift. We give the top news story of the month that the happy couple were married, headlines for the year, top movie and song, a few prices for their wedding day, and some headlines for previous milestone anniversaries. Can only be created for wedding dates from 1900-2004. It can not be created for wedding dates AFTER 2004. 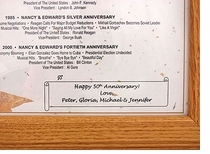 This personalized anniversary newspaper is personalized with the person's name, date of birthday AND YOUR SPECIAL 70 CHARACTER PERSONAL MESSAGE AT THE BOTTOM (See Inset photo). Printed on a champagne-confetti stationery. 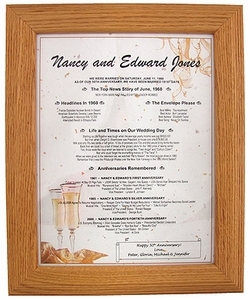 Includes 8 1/2" x 11" light oak frame. Sawtooth hanger included. Note: If you prefer a less expensive anniversary newspaper with NO personalized message at the bottom, order the Anniversary News product below on this page. If you order the personalized anniversary newspaper and do not give us a personalized message a generic "Happy XXth Anniversary!" will be supplied as the personalized message.